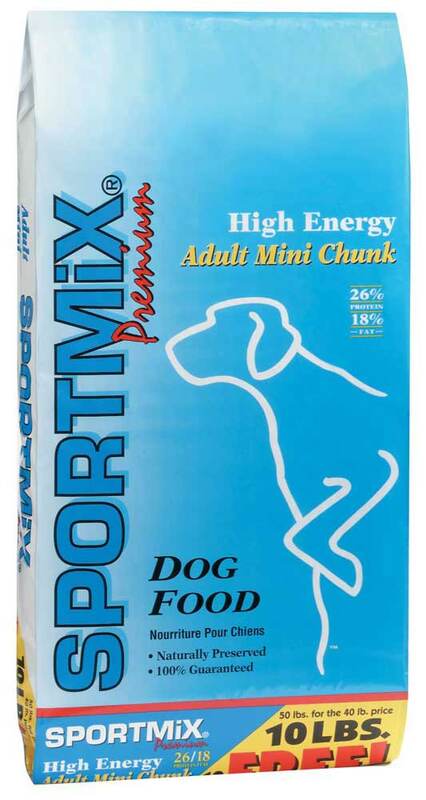 SportMix is another dog food line processed and assembled by Midwestern Pet Foods, Inc to provide a balanced and exhaustive diet for adult dogs. 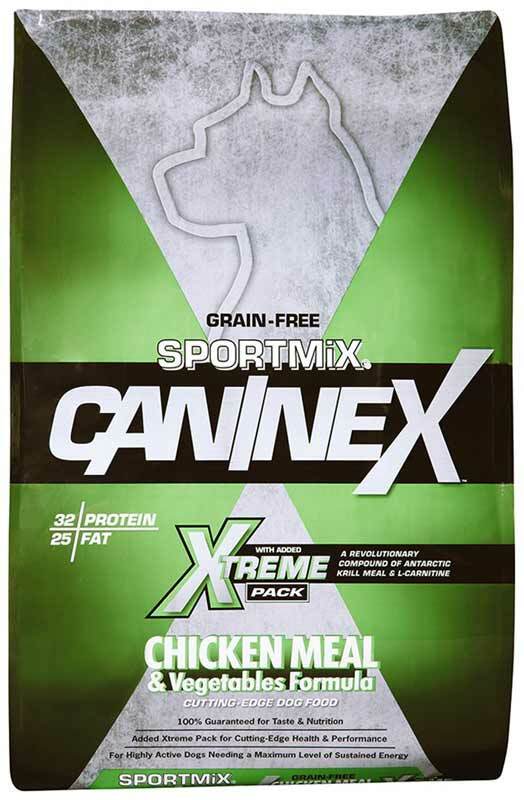 This unbiased review of the various dog food product lines from SportMix means to help pet owners like you find the best food for your beloved pet, even if he is an active dog. The company started their operations way back in 1926 and its present location is in Evansville, Indiana.SportMix is assembled exclusively in the United States and has expanded the distribution of their products to over 65 countries around the world. 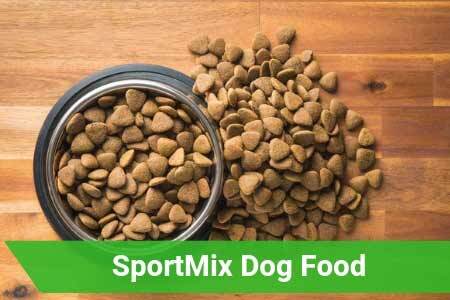 The idea behind the success of SportMix is the creation and process of dog food products that offer balanced nutrition with vitamins and minerals, are great tasting, and are affordable as well. This means that every one of SportMix products contains the right balance of minerals, protein, vitamins, and fats to promote glossy and silky coat and skin, optimum health, and strong bones and muscles for all canines. 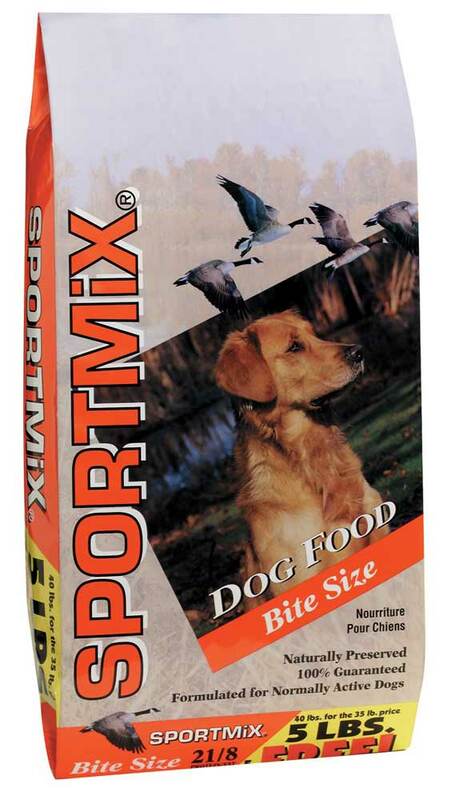 SportMix can be purchased from online dog food retailers, pet food chains, and local pet stores. Online retailers often offer SportMix printable coupons. All you need to do is to provide your email address in exchange for the coupons. You can also visit the official website of the company to find updates and special offers. Lamb meal is the first ingredient listed in this dog food product. A meal product is considered a meat concentrate ingredient and, in this case, the lamb concentrate provides more than 300% protein content compared to fresh lamb meat. A complex carbohydrate in the form of brown rice is the second listed ingredient. Cooked brown rice can be easily digested by most dogs but provides modest value when it comes to nutrition. The only reason for including brown rice is to provide a natural source for dogs. Rice flour is seen as the third ingredient of the product. Rice flour is a gluten-free ingredient that is sourced from either brown or white rice. Its gluten-free element makes it a good alternative for wheat flour. Natural fiber is provided by this product in the form of peas. Peas also happen to be the fourth element and a good source of fiber and carbohydrates. Fiber-rich rice bran is the fifth element included in this product. It is a healthy by-product sourced from whole grain rice. Other than fiber, rice bran also contains fat, minerals, protein, and vitamins. One outstanding ingredient of this product is the menhaden fish meal. As the sixth ingredient, menhaden is richly loaded with omega-3 fatty acids and protein. Since the natural habitat of menhaden fish is usually mid-depth, they are not prone to mercury contamination, unlike deep-sea fishes. Chicken fat as the seventh ingredient is a good addition. It is rich with omega-6 fatty acids and linoleic acid which is a premium quality to have in any product. The controversial beet pulp ranks as the eighth ingredient of this product. Some see beet pulp as cheap filler while others think it helps with lowering blood sugar levels. Whatever the conclusion about beet pulp, the reasonable amount included in this product meets acceptable standards. The inclusion of chelated minerals is saying a lot of good for the product. The best dog brands in the market always include chelated minerals because of its crucial function in making the food easier to digest. 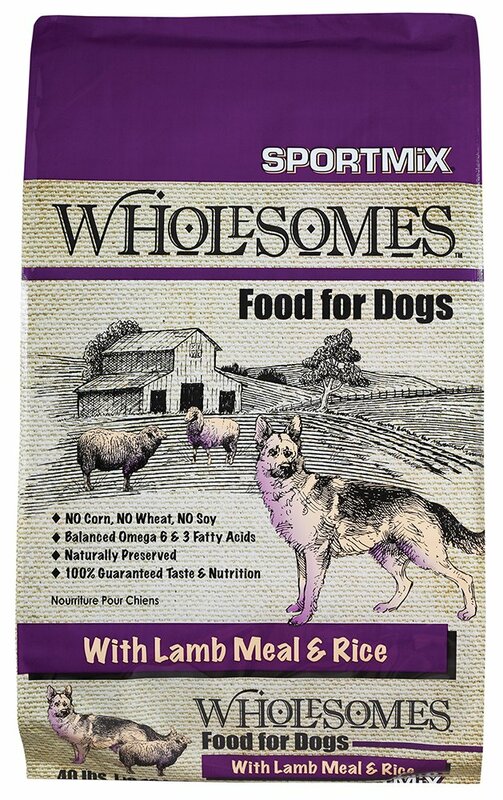 The Wholesomes Sportmix Rice & Meal dog food formula can be viewed as an above-average product if taken through the context of its ingredients. By looking at the overall product line we see a protein content of 24% which nets a near-average score. The fat content is also seen as near-average at 13%. The 54% carbohydrate net is above-average. What does this all mean? Simply put, the protein content sourced from animals is modest. The bulk of protein content is supplied by plant sources which offer a lower nutritional value compared to animal-based protein. The final verdict is a recommended product with a total rating of 3.5 stars out of a perfect 5 stars score. Chicken Meal is listed as the first ingredient which is an excellent choice. The chicken meal is a meat concentrate that provides as much as 300% protein content compared to fresh chicken. Peas as the second ingredient provide natural fiber for the formula. They are also a rich source of carbohydrates. Third on the line is chicken fat. Chicken fat is derived from fat skimmed off the surface of the chicken soup. The benefits from the fat include healthy amounts of omega-6 fatty acids and linoleic acids which are beneficial to all life stages. Omega-3 fatty acids derived from flaxseed is the fourth ingredient. Flaxseed also provides excellent soluble fiber when they are processed into a meal. In this particular product, flaxseed represents 19% protein content which means that not all protein is derived from animal by-products. Dried beet pulp makes up the fifth ingredient. The court is still out on beet pulp with some saying it’s a good ingredient and some saying it is only cheap filler. However, the amount included in this product is within an acceptable range. The sixth ingredient in line is krill meal. This close cousin of the shrimp is capable of providing almost 300% protein content to the product. Dried egg product is listed as one of the ingredients in this particular formula. This means that the egg is a dehydrated by-product derived from eggs that did not successfully hatch. While this may sound unappetizing, the egg offers a good food value and also easier for dogs to digest. Dried apple is seen as the ninth ingredient. High in fiber content, this dehydrated form derived from a natural fruit also provides rich nutrients. It can be said that this particular product from SportMix could get an above-average rating on the ingredients alone. However, the content amounts of the ingredients can tell a different story. Looking at the total amounts of protein based on animal by-products make you see that plant-based protein is more significant than named meat meals from animals. While the product is still recommended, it is only average dog food that may not be suitable for all dogs. Corn is the first listed ingredient which is not only controversial but also a cheap element to add in dog food. Corn cannot meet the nutritional needs of any dog even when it can be considered as a good source of energy. The meat meal as the second ingredient gives a vague description of the element. This means that it can be derived from any animal source to include, road kill, euthanized pets, dead pets, and spoiled supermarket meat, dying livestock or diseased animals. Since it is listed as a meal, it is considered to provide 300% more protein content compared to fresh meat. However, we still do not see if this is a good quality ingredient for dogs. Wheat is seen as the third ingredient. Since this is another grain cereal product like corn, it may also bring on the same problems. Soybean meal as the fourth ingredient can give as much as 48% protein content. However, since the protein content is plant-based, it offers a lower nutritional value than animal meat. We see the fifth listed ingredient as chicken fat. As stated, the rich content of omega-6 fatty acids and linoleic acids found in chicken fat is highly beneficial to all dogs, regardless of breed and life stages. Sodium chloride or commonly known as salt is the sixth ingredient. Salt is considered as a mandatory mineral for both humans and animals but the actual amounts used in this product is not shown. This makes it almost futile for us to know its nutritional value. The minerals added to the product do not show the chelated variety. This might make the product more difficult for dogs to digest. Chelated minerals can always be found in premium dog food products. A kibble becomes more digestible when probiotics are added to the product. In this case, the absence of probiotics informs us that this might be a hard-to-digest food product. Looking at the list of ingredients alone makes us conclude that particular recipe is below-average dry dog food. We do not recommend this product because of the poor quality of ingredients. This recipe shows that the dry dog food contains significant amounts of plant-based protein rather than animal meat. The animal meal content is also questionable since it does not contain any information where it was derived from. Chicken by-product is the first ingredient seen in this particular recipe. This means that the chicken used is a slaughterhouse waste converted into a dry form. The converted dry form uses only the remaining parts of the chicken after the best parts have been removed. This further means that the ingredient was derived from organs, undeveloped eggs, beaks, and feet. While the ingredient can claim to contain more than 300% protein, it still depends on the quality of the sourced material. Corn is seen as the second ingredient. We do not see any nutritional value in adding corn to the recipe other than giving a good energy source. However, the issues surrounding corn far outweigh the claimed benefits. Meat meal occupies the third slot, claiming to be a meat concentrate that is loaded with protein. It may be so but the description is too vague to make us suspect that it came from other undesirable animal sources such as road kill, dying or diseased livestock, etc. The inclusion of wheat as the fourth ingredient is another issue-riddled addition to the product. Wheat, as you now know, has the same problems as corn. Chicken fat as the fifth ingredient is good for the benefits given by its omega-3 fatty acids and linoleic acids content. Beet pulp is listed as the sixth ingredient. This is another controversial ingredient that may or may not help make this recipe a good dog food choice. However, rest assured that the amount used in this product is within acceptable limits. The fish meal claiming to be loaded with protein is the seventh ingredient. While it is a good source of protein, the fish used is not mentioned. We would have seen if it is a good addition to the product if we knew the kind of fish used for it. Flaxseed as the eighth ingredient is a good choice. The soluble fiber it provides plus the omega-3 fatty acids content makes it a beneficial ingredient. The absence of probiotics means that this product might not be easily digested by dogs. The non-chelated minerals added to the recipe prove it to be a low-quality product. We do not recommend this product. The plant-based protein content is not up to par with a high-quality dog feed. The questionable and vague ingredients convince us that this may not be the best dog food option for any dog. When deciding on the food that you will give to your dog, there are two things that many pet owners forget. While the quality of the ingredients and price and paramount, we should always remember that a good product also has good reviews and good customer support. Unlike other features, the cost of good community relations is not counted in money, but in your time and nerves. It is good to know that SportMix has made an effort not only to create a premium product but also to have open communication with the public. This openness doesn't only reassure us that we are talking about a good product, but that any flaws that come up will be noted, addressed, and dealt with. Above all, Sport Mix reviews are generally good, with customers mostly reporting good results with their dogs in teams of activity, health, as well as general wellbeing. There are several benefits if you opt for SportMix dog foods that are mentioned in customer reviews more than others. Primarily, it has a small and irregularly shaped kibble size, making it a good choice for either small dogs, or large dogs that have a drolly muzzle. For small dogs, the reason is obvious, as they can place the whole pellet in their mouth and bite it down without any issue. For larger dogs, the reason is not obvious, as it has most to do with gasses. When munching on small kibble, the excess air can escape, making only the food enter the system. Customers who have changed from larger dry food or canned food and have breeds like boxers or Bulldogs have reported that their dogs don't have problems with gas and digestion any more. Finally, SportMix food is very nutritious and high in calories and protein. This means that it will give more than enough energy to your dog without stuffing the dog with ingredients that it doesn’t need. Finally, as SportMix is not as established as other premium brands, it is significantly cheaper than its competitors, while still being a high-quality product, making it a great value purchase. The high-calorie count on this product means that it is very easy to overfeed your dog without realizing it. Unlike many other products that you can measure by volume, here you will need to count some calories. Several consumers have reported their dogs gaining weight quickly after switching to SportMix, and you should be aware if this is the result you want or something that will negatively impact the dog's health. SportMix is undoubtedly a high-quality product, and more of than not it is a great value. The only problem is that not all shops that sell it have agreed on the retail price, making the price vary quite significantly in some cases. To avoid paying any unnecessary amount, you should always compare prices from several places and try to collect coupons as well as buy in bulk. Making your purchase this way will not only save your wallet a pretty penny but will also ensure that your dog will have a steady supply of high-quality food. Being a smart customer will not only protect the digestive health of your furry friend but will help your health as well, guarding your nerves from always wondering if your dog has food and how much will that food cost you. You might get confused with the product and customer reviews regarding SportMix. The product reviews show a different story from the customer feedback. Bear in mind that the product reviews are based on the ingredients included in each product. The positive reviews from the customers shed a different light to SportMix. The fact that most dog breeds seem to love and thrive on them show that the animals have the final say when it comes to the food they like or dislike. 5.5 What to Look After?